Sounds interesting. I had never thought to coat meat or fish with nuts. 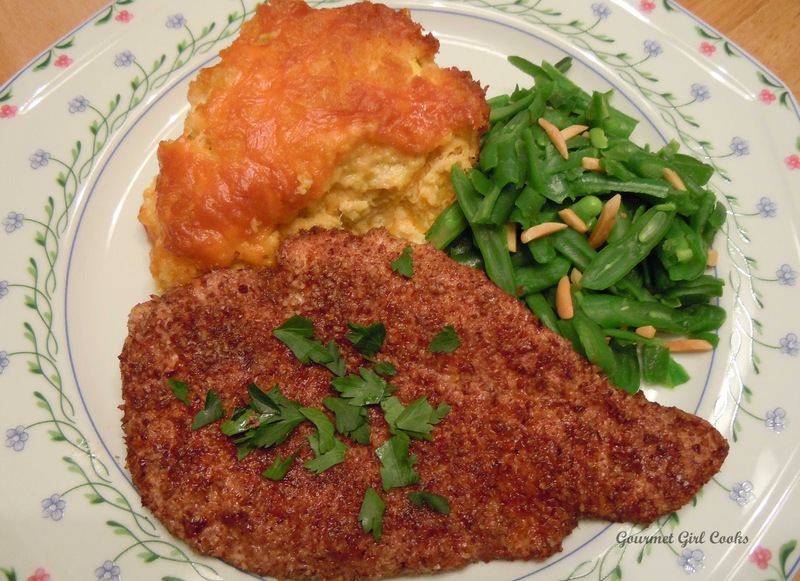 I've been meaning to try almond meal as a coating for chicken breasts. Yours looks fantastic, so I will definitely be trying it! Was wonderful. I fixed Chicken and Squash tonight. Had a problem with the nut coating burning. Was either the nuts or the olive oil/butter. End result was the same - smoking and blackened. Cooked it on Med. and alittle hotter than that. Thanks, Kath -- be careful not to cook it too long on high heat (or your nut coating might burn). The best way not to have to cook the chicken too long is to either use chicken cutlets or flatten boneless chicken breasts with a meat mallet to about 1/4" or so in thickness -- that way they cook quickly. I hope you enjoy it! Hi JG -- Sorry you had trouble with it burning -- it's a fine line between hot enough and too hot. You want the pan/oil hot when you place the chicken in the pan but you may need to turn it back down to medium to cook. Also, make sure you are using thinner cutlets or flattened chicken breasts so your cooking time isn't too long and that way your chicken gets cooked before you nut coating gets overcooked. Did you use pecans for your nut coating? Also, if your stove heats a little hotter, you might want to cut the heat back a little more once you place the chicken in the pan. Also, I used 1 T of butter and 1 T of olive oil -- but I used extra light olive oil when I fry or saute at higher heat -- not the extra virgin which is more heat sensitive and doesn't do as well at higher temps. Hope those suggestions help you out next time you make it! :-) I hope you enjoyed the squash casserole! Thanks! Boom is right! Those look easy and delicious!